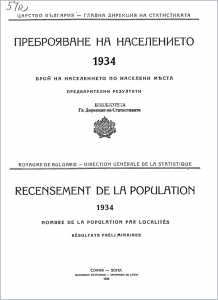 The digital library of the NSI provides users of statistical information the possibility of free online access to 1 605 pages of the digital collection ‘Census of Population and Housing Fund in the Kingdom of Bulgaria on 31 December 1934’, which is published for the first time on the Internet. On December 31, 1934 began the ninth general population census in the Kingdom of Bulgaria. It was carried out under the Law on General Censuses and Decree No. 2 from April 18, 1934. The objects of the census were population, buildings, industrial, commercial and other establishments, and the goal was to establish the number of surveyed units and their distribution on important for the state and science indications. The organisation of the census was entrusted to state and municipal employees. The control over the work of the enumerators was assigned to agent-supervisors and municipal authorities and mayors had the responsibility to assist its correct and lawful conduction. Allocated were the necessary time and resources to prepare the population for participation in the Census. As part of the awareness campaign, in December 1934 employees of the General Directorate of Statistics organized and held conferences in all cities and many villages in the districts. In order to win the trust of the population were conducted lectures, leaflets were printed and articles and appeals were published in the daily newspapers. Bulgarian teachers were called upon not only to take a direct and active participation, but also to arouse their interest in population census. The Ministry of Education prescribed for the teachers in the period 17 to 20 December to explain the students in two class hours the benefit from it and to familiarise them with all kinds of census maps and the ways of filling them. The enumeration began at the appointed day across the whole country, in all 5 752 settlements. With this nationwide task are involved 45 112 enumerators, and 6 151 of them were agent-supervisors. Every enumerator accounted for 135 enumerated persons. For the first time were collected data on education of the enumerated persons and economically active persons were registered by their main occupation under new nomenclature of occupations.